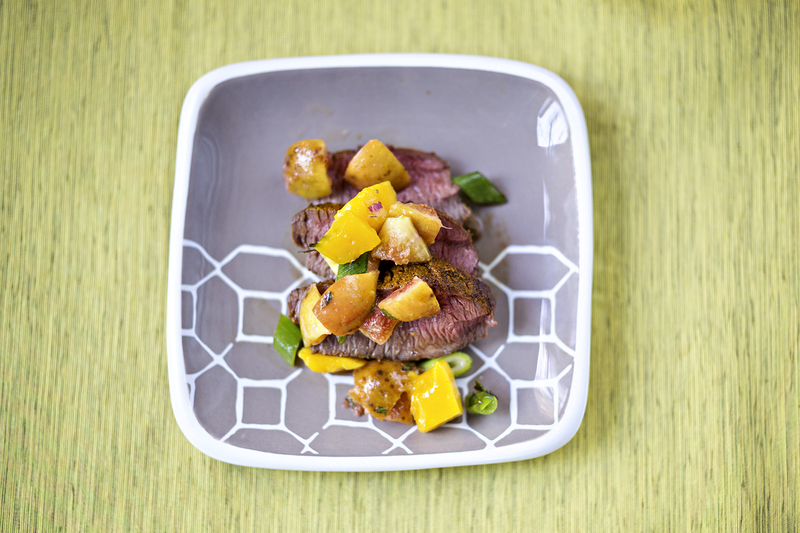 Give your steak a tropical twist! Some people never get tired of wrapping venison steak in bacon. As someone that generally dislikes bacon, clearly I prefer doing something different. Yeah yeah, my distaste for bacon inspires some pretty intense scrutiny from people sometimes. Once, upon hearing I didn’t like the taste of bacon, someone actually told me they hated me. Out loud, to my face. Needless to say people feel very strongly about the matter. At any rate, maybe you’re tired of bacon (the horror!) or just want something a little different and lighter, this is a great way to liven up your venison steak! This recipe is extremely versatile. I added fresh figs to the mango salsa, because they are in season and I had some I needed to use up. It definitely added an extra layer of sweetness but they are totally optional. You could also do a peach mango salsa, or really whatever you like. As far as cooking your steak, well, this is entirely up to you. I did it in the oven, because I was making other things in the oven that day and I already had it on. Tenderloin is usually thin enough to pan-sear or of course you can always grill it. Have hankering for tenderloin tacos? Simply wrap the whole thing in a tortilla, and maybe add a slice of avocado. The possibilities are endless. You can switch up the spices too. I kept it simple with a good sprinkle of turmeric and chile powder. I really like the way the sweetness of the mango with the lime juice cuts right through the pungent, earthy flavor of the turmeric. It plays together very well. Pull the tenderloin/sirloin steaks out of the fridge and let come to room temperature. Preheat the oven to 450. Season the steaks with the turmeric, chili powder and salt and pepper to taste on both sides. On a foil-lined pan, cook at 450 until desired doneness (about 7-12 minutes for medium rare depending on thickness). Steaks can alternatively be grilled. Meanwhile, combine the mango, fig, mint, green onion, oil and lime juice and toss together. Once the meat is done, let rest at room temperature for 5 minutes and slice. Top with the salsa and serve warm. Non game substitution: You can use any cut of beef steak; I recommend skirt steak.